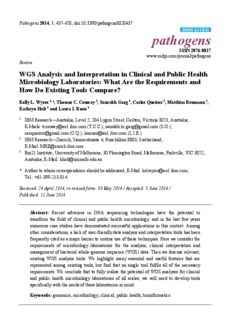 eCite - WGS analysis and interpretation in clinical and public health microbiology laboratories: what are the requirements and how do existing tools compare? Recent advances in DNA sequencing technologies have the potential to transform the field of clinical and public health microbiology, and in the last few years numerous case studies have demonstrated successful applications in this context. Among other considerations, a lack of user-friendly data analysis and interpretation tools has been frequently cited as a major barrier to routine use of these techniques. Here we consider the requirements of microbiology laboratories for the analysis, clinical interpretation and management of bacterial whole-genome sequence (WGS) data. Then we discuss relevant, existing WGS analysis tools. We highlight many essential and useful features that are represented among existing tools, but find that no single tool fulfils all of the necessary requirements. We conclude that to fully realise the potential of WGS analyses for clinical and public health microbiology laboratories of all scales, we will need to develop tools specifically with the needs of these laboratories in mind.